Crystal Hotel - with its ideal location in Saigon City Centre: next to Zen shopping plaza and 500 m away from Ben Thanh Central Market - comprises of 32 international standard and fully equipped rooms. Those are not only what we have, but also the hospitality of our well-trained staff who will satisfy all your requirements. Small and cosy lounge equipped by Vietnamese traditional style furniture will relax you after a long day working or sightseeing. Nice and young receptionist are eager to satisfy all of you requirements, just give them a call. 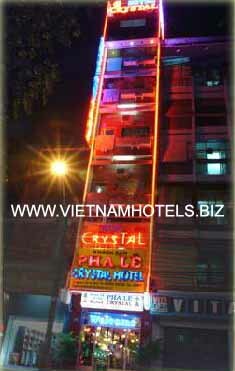 Hotel locatied in the center of district 1 of Ho Chi Minh City, supplying such equipments for each room as. Free wireless Internet access in room. International direct dialing calls (IDD) and fax. Bathroom with bathtub and hot - cool water set. Elevators and indivdual - Electric generators.